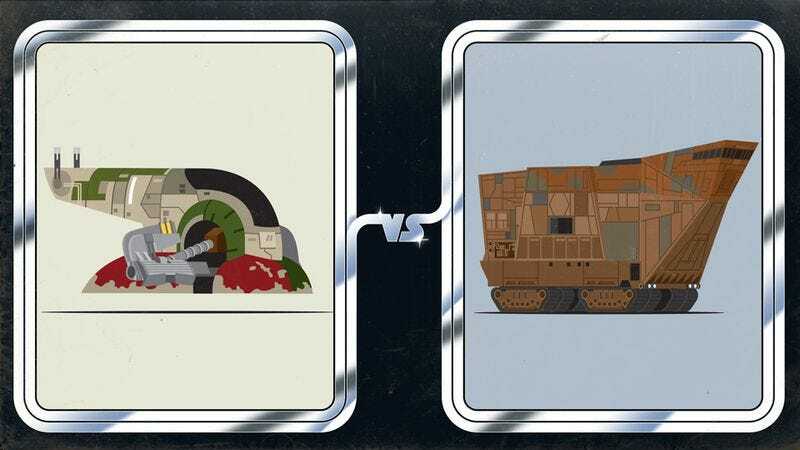 In space or on Earth, is Boba Fett’s ship or a Jawa sandcrawler better for running errands? Star Wars creatures, critters, and robots get lots of appreciation, but what about the imaginative carriages that make all the heroes’ galaxy jetting possible? With Star Wars Wars, The A.V. Club showcases some of the best vehicles in the galaxy far, far away by bringing them down Earth—our Earth, specifically the suburbs, where we imagine what Star Wars conveyances make the best modes of transport for gas-guzzling mall treks and country-club jaunts. Vote for your favorite in our poll, and Friday will see the four winners duke it out for the title of best Star Wars suburban ride. Yesterday saw the tauntaun and AT-AT go head-to-mechanical-head for the best way to get around in wintery conditions; today, our writers defend the better vehicle for running errands. The Jawa sandcrawler brings R2-D2 and C-3P0 to Luke Skywalker, and so what if its owners took the droids against their will and subjected them to viewing the torture of their fellow ’bots? The sandcrawler got them where they needed to go, an enormous house on wheels hardy enough to travel through the desolate Tatooine desert. Boba Fett’s Slave I ship, on the other hand, transported Han Solo in a block of carbonite across the galaxy, taking him to the last place he wanted to go—Jabba The Hutt’s menagerie and Han’s certain doom. Both vehicles played their roles in transporting our heroes and moving their stories forward, but what about when their owners put their cruisers to work on less glamorous activities? Groceries, dry-cleaning, and dropping the kids off at soccer might not be as exciting as transporting captured droids and scoundrels, but everyone in the galaxy needs milk, be it bantha or cow. Which is better for these mundane but necessary tasks? Read on and cast your vote in the poll below.